FV Recycling is serious about recycling. As a leader in our industry, we take great pride in designing custom recycling programs for all of your waste and recycling challenges. whether you own a commercial, industrial, manufacturing, professional or retail business, FV RECYCLING WILL design a custom recycling program to meet the needs of your facility and your waste flow process. FV Recycling has a Service for Every One of Your Recycling Needs. SMALL OR LARGE, WE CATER TO ALL BUSINESSES. Higher service levels- If your organization requires recyclables to be hauled at a more frequent rate, we have the capability to haul in Less Than Load (LTL) quantities. Why tie up your equipment and payroll dollars, when you can use ours? FV driver will load material using company owned loader, which saves your organization time and money. LTL’s are ideal for retail facilities due to the limited storage space, but may also make sense in other applications. Full loads (18-20 tons) of a single commodity could be accompanied with a higher rebate. We can either spot a trailer or live load. Can also haul unprocessed (loose) material to plant for processing. CLICK THE BIN FOR MORE INFORMATION! 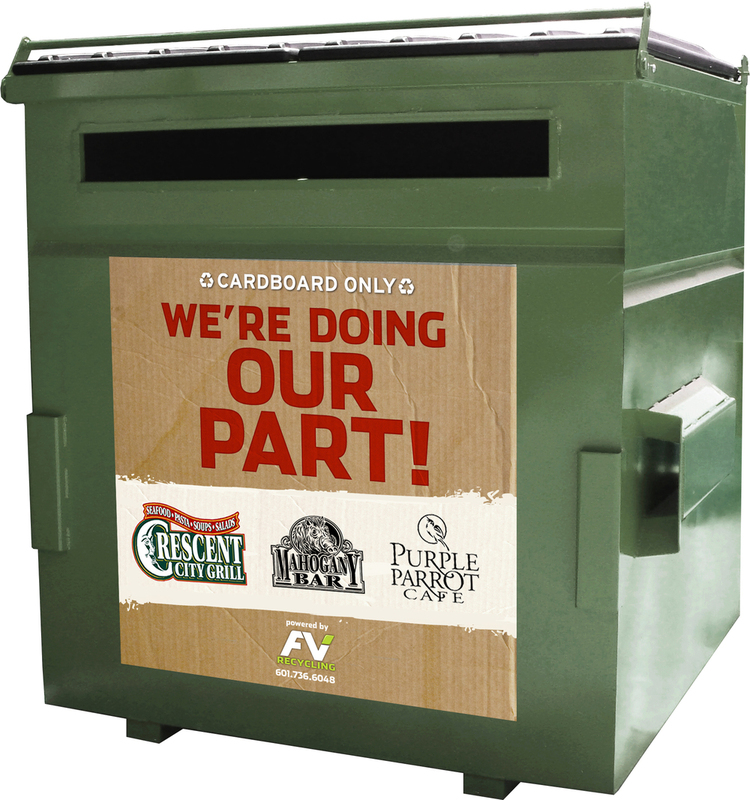 CLICK THE DUMPSTER FOR MORE INFORMATION! CLICK THE BALER FOR MORE INFORMATION! Click HERE for a FREE site audit. Allow FV to coordinate transportation of recyclable commodities. FV has access to multiple buyers across the country; allow us to find the best possible rebate for your recyclable commodities. FV recycling is established in Louisiana, mississippi, alabama and the panhandle of florida with brokering capabilities across the united states.